The traditional explanation for the retail apocalypse is that Walmart and Amazon killed malls and big-box stores, but that account is incomplete -- the real story includes massive asset-stripping by debt-financed private equity vultures who paid themselves lavishly to run beloved businesses into the ground. 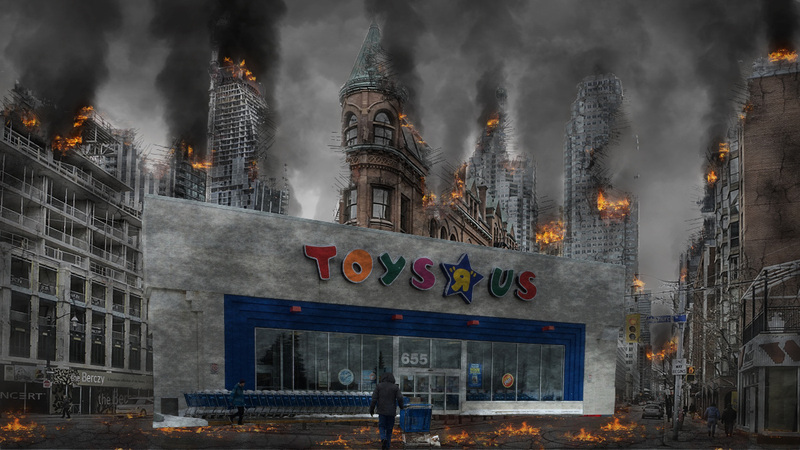 Whatever the reason, the American landscape is now littered with thousands of acres of empty retail buildings, the ruins of Toys R Uses, Teavanas, K-Marts and other national chains. These odd buildings were purpose-built for a very specific use and will require substantial retrofits to re-use (though some uses require less retrofitting than others). Popular Science rounds up a survey of architectural plans for repurposing these colossal corpses and their spreading, sprawling parking-lot aprons. Many of them will be tear-downs as they were build cheap and fast with poor-quality materials that are nearing the end of their duty-cycles; others are sturdier and invite speculation about conversion to housing ("You’d have to start poking holes in the roof to bring the light in the air in them"), museums, churches, libraries, etc. Much of this is already taking place, documented in Big Box Reuse, a 2008 book by the artist Julia Christensen. “These cavernous volumes are so adaptive to so many functions,” he says. “You could imagine a new and lively semi-urban environments starting to develop.” Just one idea? Turn ghost stores into vibrant housing. “You’d have to start poking holes in the roof to bring the light in the air in them,” Leddy says, thinking aloud. “The volumes are such that you could probably fit two or three floors of housing and then create courtyards between them.” He's working toward a day where light rail—or driverless carpool initiatives or electric buses—connects numerous box store apartment communities to one another. Julia Christensen is an artist and author of the book Big Box Reuse. The book, which was published in 2008, documents the ways 10 communities transformed their own empty box stores. In old Walmarts, Christensen found churches and community centers; in old Kmarts, courthouses and museums. Though not included in the book, one of the most famous big box reuse cases is the McAllen Main Library, which turned an abandoned 124,500 square-foot Walmart in Texas into a single-story library with plentiful community and educational spaces. The McAllen project cost $24 million, according to an interview with Strong Towns, $5 million of which went to buying the abandoned Walmart facility.